We're a one phone call stop for your all your needs — small, large, hard-to-find, Last-minute and even out-of-stock items. We're your source for customized orders and products. If your requirements take you "outside-the-box", call our team. We are a relationship-oriented business and believe in first names. We want to be invested in your success! We distribute from all manufacturers. Sourcing from the US, Europe and Asia, we can your supply all your wide-range kitchen needs from small equipment to large, from pots and pans to knives and foils, and so much more. Whether you are budget shopping or seeking a high quality style, we will go the extra length to find exactly what you are looking for. Beverages and mixers? No problem. Condiments, snacks and candy made-to-order? We do it. Shakers, stirrers, straws, custom napkins, custom glassware, pour spouts, aprons, olives, cherries, agave nectar, bitters, and all the multitude of gadgets, gizomos and doodads required for a bar business, we'll get it all for you. We are here to make your life and business easier. We are your go-to source for toilet paper, toilet seat covers, multi-fold towels, cleaners, mops, scrubbers, trash can liners and a plethora more supplies that you most likely need. Best yet – we can customize your order so if you want eco-friendly or food-safe cleaning products, we know where to get them. It’s a one-stop shop. LBS specializes in custom printed orders with your logo and art. It's the finesse of presentation, and it makes one of the bigger statements about who you are and your food business – the tabletop design. Dinnerware, flatware, glasses. Fuel cells and candles. You may be elegant or casual or trendy, but no matter your vision, we will go to all lengths to implement your ideas to keep you styled, stocked and stoked. 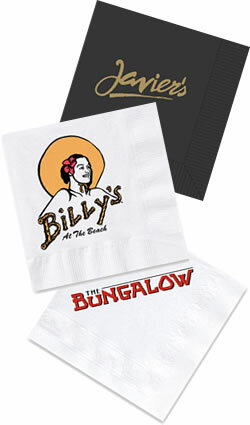 Customized "to-go" bags and cocktail napkins. Eco-friendly paper products. Register ribbons, thermal paper, 2-part paper... we tap a wide variety of suppliers to get your needs met. If you can think of it (and it exists), we'll get it! Takeout or take home – it's the heart of many food businesses. Your customers want and/or need something to carry your food back to their home. We offer customized cutlery kits, eco-friendly solutions and biodegradable products, in addition to the usual smorgasbord of options we can offer for plastic ware, bowls, containers and more. Bring us into your business and you'll be ready to-go.